A number of homeowners who have started moving in to Verawood Residences, DMCI Homes’ latest resort-inspired, mid-rise condominium in Acacia Estates in Taguig City, are all smiles nowadays. And who wouldn’t? The family moved in to their unit in Wisteria Building last September 2015 and now enjoys a shorter period of travel going to work and more time to spend for their only daughter. With the development being so close to major thoroughfares, many of them can now reach their work places in less time than they used to — and they can go back home just as easily. 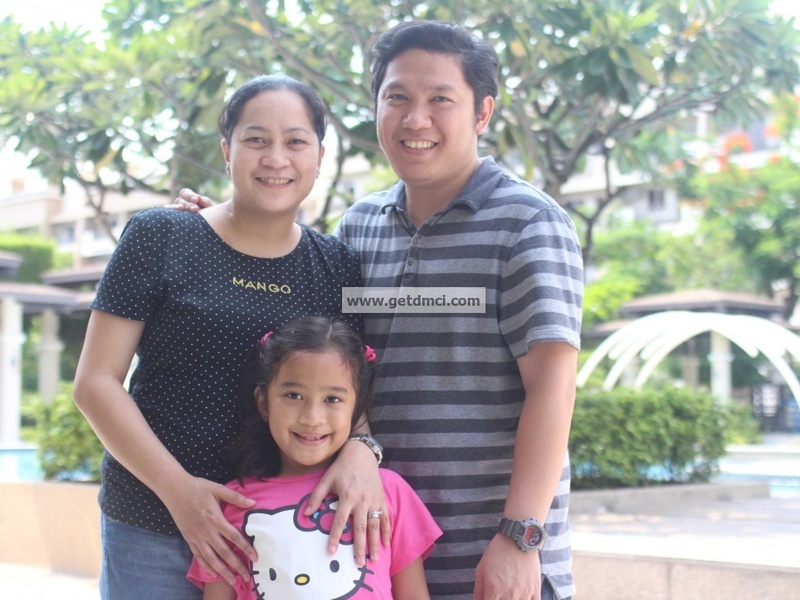 For Mr. and Mrs. Rogelio and Wilma Lindain, this means more time for family bonding. The Lindain couple is among the first batch of residents in the 6-storey Wisteria building of Verawood Residences, a 3.4 hectare mid-rise condominium development of DMCI Homes that sits within the 150-hectare Acacia Estates. Verawood Residences offers a home that is far away from the hustle and bustle of the city but is still near major roads, commercial centers, hospitals, schools and the airport. It is just three kilometers from Bonifacio Global City. It is also near the Makati Central Business District and is accessible to Quezon City, Ortigas, and Southern Metro Manila via C-5 Road. “Verawood Residences is nearer to our workplaces than our house in Las Pinas. We can drive to work in 15 or 30 minutes when traffic is not heavy,” says Wilma, who works in an office in Pasig City. “Before, our travel time to work from Las Piñas takes us almost 3 hours,” says Rogelio, whose office is in Eastwood Libis, Quezon City. Wilma adds that because they can drive home early, she can help their 6-year-old daughter, Sara Nicole, do her homework. “Our priority, really, has always been to give more time to our daughter,” she says. In fact, one of the reasons why the Lindains have bought a 3-bedroom unit at Verawood Residences is because it is near their daughter’s school, Colegio San Agustin. “Aside from being near our workplaces, we also know that our daughter would be safe at home when we are in the office,” says Rogelio. This tropical paradise actually offers a highly-secured community — security guards rove the gated property 24/7. The perimeter fence is also electrified. The idea of living in a condo was brought up to Wilma one day after she and her friends held a get-together at a home of one of their friends in Cedar Crest, one of the mid-rise condominium communities within Acacia Estates. What she saw in that unit at Cedar Crest appealed to her. Before that get-together, Wilma and her husband have already been checking other condominium units in other locations, but many of them either offered small-sized units or had a noisy neighborhood. They also considered the track record of its developer. About a year ago, the wife of one of Wilma’s co-workers, a real estate broker, introduced them to Verawood Residences. “We chose to buy at DMCI Homes’ Verawood Residences because the units (here) are bigger,” says Rogelio. Each of the seven residential buildings of Verawood Residences has more than 100 2- and 3-bedroom units evenly allocated in six floors to ensure low-density and private living. Unit sizes range from 56.5 to 87 square meters, which is ideal for startup couples, growing families, and professionals. All units have a balcony, efficient layout, elegant finishing, high quality fixtures and provisions for Internet, cable TV and telephone. The buildings also have single-loaded hallways and atriums that eliminate the constricted feeling common in many condominiums and do not make unit doors closely face each other. Breezeways naturally ventilate and illuminate floors and corridors, a signature design of DMCI Homes. Other features of each building are a scenic elevator, mail area, service area at the roof deck, carpark, fire alarm and fire hose cabinets in hallways, and fire exits at both wings. The Lindains also found the Verawood Residences’ community and its neighborhood as beautiful. After all, it was designed to give a Polynesian feel to modern urban living. Its architecture has Polynesian inspiration like asphalt shingles for roofing, projecting wood beams, simple lines, white stucco walls, light colored accents of wood and stone all imitate the look and color of traditional thatched roof houses in the Pacific islands. Like the open ocean location of Polynesia in the Pacific, the condo community has that analogous openness as only a third of the 3.5-hectare land hosting the development are occupied by buildings. At the center is a clubhouse featuring adult and kiddie swimming pools with poolside palms, landscaped gardens and lounges that produce a total resort vacation atmosphere. Families can also relax and enjoy a picnic at the open grove, while kids can have fun at the open playground fitted with modern play equipment. The health-conscious can regularly exercise at fitness gym or at the jogging path, and shoot hoops at the basketball court The clubhouse’s indoor amenities also bring the same calmness, playfulness and fitness available outdoor. Residents can pass time or entertain guests in the lounge. Friends can have a few rounds of billiard in the game area. The Save More supermarket and dining establishments in Acacia Estates’ Town Center, just outside Verawood Residences, adds convenience to residents. The couple also believes in the quality of their property investment as they know that DMCI Homes is a reputable and trustworthy developer. The triple-A property builder has extensive experience in home solutions that have satisfied thousands of homeowners. Source: Article published in Philippine Star last October 3, 2015 featuring Lindain family of Verawood Residences in Acacia Estates. All units in Verawood Residences are sold out. But not to worry, DMCI Homes understands the needs of our clients, reason why, IVORY WOOD, a mid-rise preselling development similar to Verawood Residences in Taguig is now open for selling!